Aheadworks offers an excellent opportunity to draw your customers’ attention with the help of customizable popups: you only need the Magento 2 Popup Pro extension to be installed. The module supports targeting options, so you can easily narrow down the audience and increase the effectiveness of pop-up windows. Furthermore, Aheadworks offers a set of customization options for the effortless adjustment of how your messages are displayed to customers. Thus, the Magento 2 popup module lets you create highly customizable newsletter subscriptions, guides, promos, policy explainers, and other popup windows without any headaches. It is also worth mentioning that the Magento 2 popup extension by Aheadworks provides performance stats related to each popup for tracking its efficiency right in the grid and on a page of each popup. 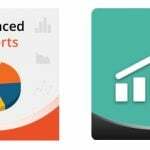 As a result, the Aheadworks Popup Pro extension helps ecommerce store owners increase conversion rates and customer engagement by using efficient customization and targeting options for online popups. 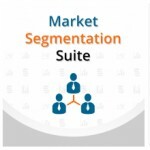 As for targeting options, there are three ways to narrow down popup audience. 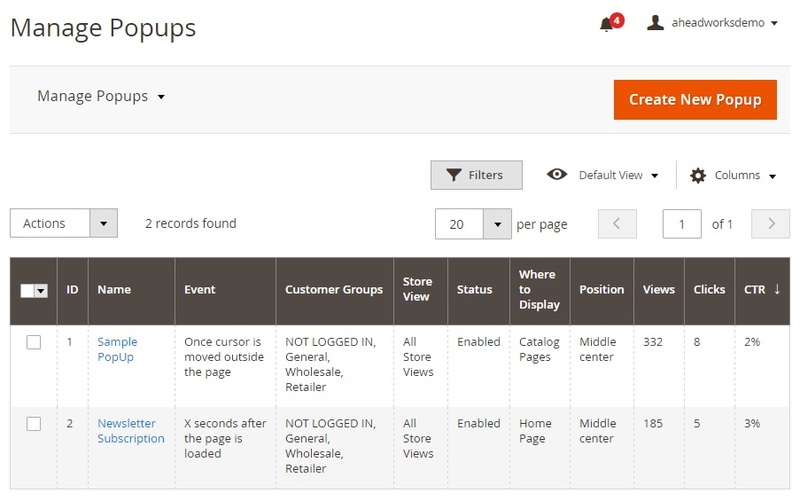 First of all, you can adjust the Magento 2 popup extension to show different popups for different store views and customer groups. Then, you can divide popups according to a page type, so different windows will appear on a home page, product, catalog, shopping cart, and checkout pages. Another approach is based on custom page selection. You can apply such conditions as a brand, size, color, and others. When it comes to popup customization, it is necessary to mention that the Aheadworks Popup Pro extension lets you utilize custom CSS and use WYSIWYG editor to make popups suitable for your ecommerce needs. Thus, you can customize popup appearance on your web store in regards to both content and design. Besides, there are options designed to control animation effects, as well as trigger events aimed at specific conditions and timing for each popup. Advanced popup triggering options allow displaying popup depending on the time spent on a page, a number of pages viewed, cursor movements with exit intent, or page scrolling. Backend experience enhancements include effectiveness tracking, backend preview, and documentation/customer support available right in the admin. It is also necessary to mention that popups are mobile-friendly and work seamlessly on any screen or device. 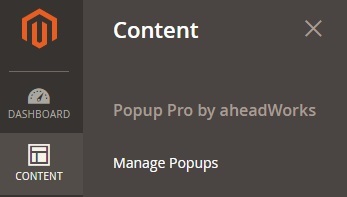 The Popup Pro Magento 2 extension is available under Content -> Popup Pro by Aheadworks -> Manage Popups. Information necessary for creating a new popup window is divided into the following sections: General Information, Where to Display, Popup Content, and Popup Design. In General Information, you choose the status of the popup (enabled/disabled), any custom name, store view, and customer groups. Then, select event for launching the popup (from five types available ), X parameter for the previous condition, animation effect (7 types available), and cookie lifetime in minutes (within this period the popup is not shown to a customer). Next, you should specify where to display the popup. Depending on the option you choose, this section has different parameters. Thus, for a home page, shopping cart, and checkout, it is only necessary to specify the position of a popup window (9 options are available). In case of product pages, you can set individual conditions for the popup to be displayed in addition to the position on a page. 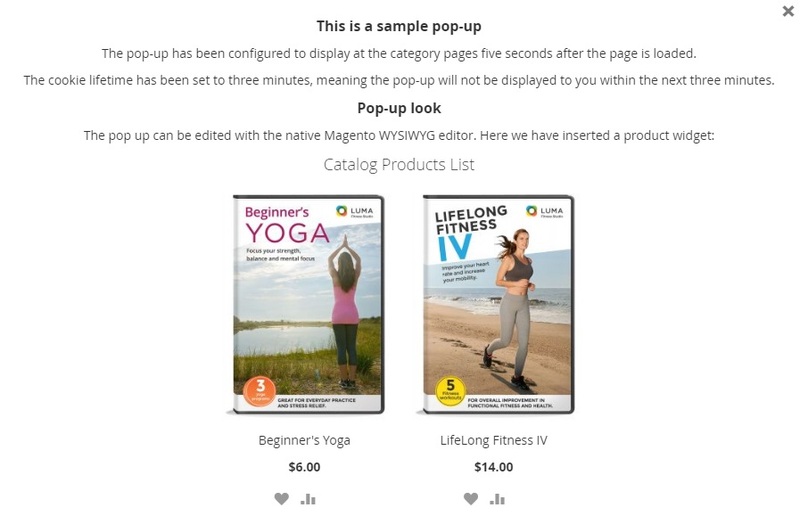 As for catalog pages covered by the Magento 2 popup extension, you should also choose categories where to display the popup. In the Popup Content section, you can rely on WYSIWYG editor. 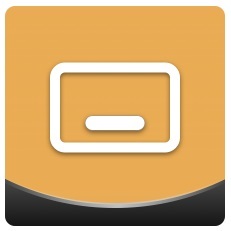 Alternatively, you can hide it and use widgets and variables. As for the Magento 2 popup extension’s Popup Design tab, it includes a window for custom CSS and a Preview button. In addition to text, it includes a product widget. Below is another example of email subscription popup which includes a CMS block widget (you can add it in the Popup Content section if you turn off WYSIWYG editor) provided by the Magento 2 popup extension. Aheadworks Popup Pro is a robust tool for creating popup windows in both Magento 1 and Magento 2. The extension has a clear and intuitive interface, as well as all options necessary for making popups more useful: you can easily customize their design and narrow down the audience. Note that Popup Pro for Magento 1 costs $99, while the Magento 2 extension is more expensive – $199, but for this money, you also get installation, 90 days of support period, and Personal Account Manager. What is more, Aheadworks offers a 50% off for Magento 1 clients!